Native to much of the U.S., from Connecticut to Kansas and south to Florida and Texas, persimmons are baseball-sized fruit with glossy orange or yellow skin and sweet pulp. Persimmon trees (Diospyros) can grow to 60 feet and are deciduous--glossy green leaves change to yellow, pink or purple before dropping in fall. Persimmon trees bloom in spring and some trees require cross-pollination in order to set fruit, so trees should be planted in pairs. 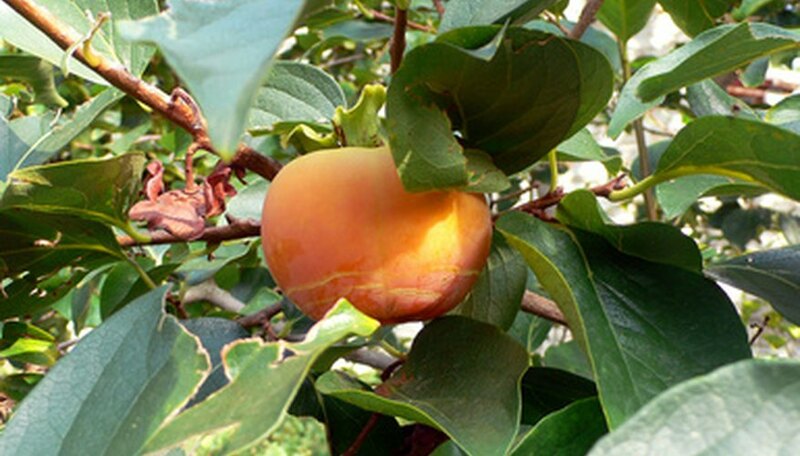 Persimmon trees may be astringent or non-astringent. Harvest astringent fruit when it is soft ripe. Plant trees in full sun and water regularly. Persimmon trees bloom in March and flowers differ depending on the tree's sexual expression--though some trees may produce both male and female flowers. Flowers are small and grow on 1-year-old wood. On male trees, flowers are light pink and grow in groups of three, while female trees produce single, cream-colored blooms. Some persimmon trees require cross-pollination while other are self-pollinating. In either case, once the bloom has been pollinated, the petals will drop and a small pea-sized fruit will begin to develop. Through the first two months, persimmons will reach about two-thirds of their mature size. During this stage, the amount of nitrogen present in the fruit decreases dramatically. After the first two months, the growth of the fruit will slow, and it will become slightly elongated, as mature fruit is rounded at the top but has a small point at the bottom. The second stage of growth lasts about three months. During this stage, the amount of nitrogen in the fruit decreases at a slower rate before spiking just before maturity.